Drew Barrymore’s engagement ring, which features a colorless radiant-cut diamond set on a simple, slender diamond-studded band is among the most talked-about celebrity engagement rings, partly for its glamorous look, and partly for the love story behind it. Born February 22, 1975, Drew Barrymore is one of America’s favorite actresses. She is also a screenwriter, director and producer, author, and model, and is a descendent of silver screen legend John Barrymore. Although her role in Steven Spielberg’s 1982 film E.T. the Extra-Terrestrial wasn’t her first, it is often described as her breakout role. She was in a number of films and television shows throughout her childhood and teens, and as a young adult, she played important parts in romantic comedies including favorites such as 50 First Dates and The Wedding Singer. Drew is beautiful inside and out; she makes a point of helping others while doing work she loves. She was named Ambassador Against Hunger for the UN World Food Program, and has donated more than a million dollars to help feed the hungry. She has won numerous awards and was named number one in 2007’s People magazine “Most Beautiful People” edition. Did you know that Drew Barrymore’s first film appearance happened when she was just eleven months old? She starred in a dog food commercial, at the same time gaining a reputation as a person who loves to laugh. When, in the audition for the commercial, the dog nipped at her, she giggled instead of crying or being afraid. The producers loved her attitude and hired her for the part on the spot! What Our Experts Have to Say about Drew Barrymore’s Engagement Ring. Drew Barrymore’s engagement ring is a work of art. Though it might be considered small by Hollywood jewelry aficionados, it’s quite a bit larger than the average woman’s ring! Featuring a colorless radiant-cut diamond that weighs in at slightly less than four carats and a beautiful diamond-covered band, it is from Graff Diamonds and is estimated to be worth about $80,000. Celebrity engagement rings like the one Drew Barrymore received from hubby Will Kopelman are well out of reach for the average consumer, but that doesn’t mean you can’t enjoy a similar look. Even if your budget isn’t limitless, you can get the exact style you want. By working with the diamond experts at Brilliance to select a ring from the many pre-set styles available or even taking a few minutes to interact with our user-friendly custom design feature online, you’ll be wearing the ring of your dreams in a surprisingly short amount of time. 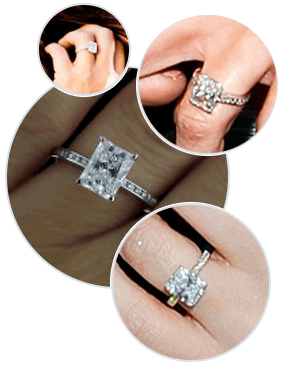 Whether you want an engagement ring like Drew Barrymore’s, or long for a look like another celebrity’s engagement ring, Brilliance allows you to enjoy unparalleled sparkle while sticking to your budget.